A trained engineer uses a specialised rig to drill a small, deep hole through the bedrock to reach fresh water below. Pipes are inserted into the hole and a tap with a hand pump is installed above. 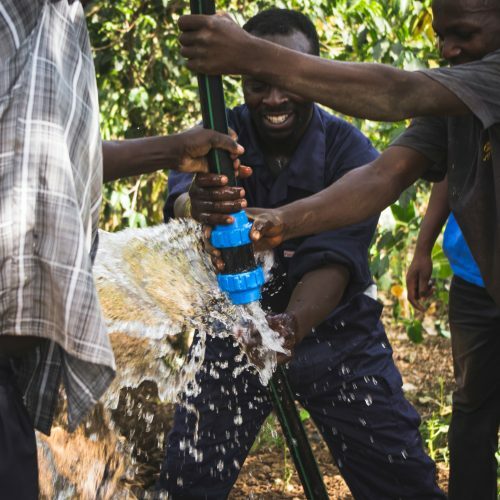 Local residents are then able to pump water that is safer to drink. Many local communities already have access to an existing water source which is often a self-dug, rudimentary well. JENGA takes that existing source, installs a natural filtration system, sterilises it and seals it off from the intrusion of polluted top water. A pump and handle are finally attached, saving local women and children the work of pulling 20 litre jerry cans up to 30 metres to gather well water. Large environmentally friendly clay tanks are constructed above ground and connected to specially installed guttering systems on local homes. Rainwater passes through the guttering before collecting into the protected tank. Access to the water is via a small tap towards the bottom of the container. Based in the foothills of Wanale mountain, JENGA has re-habilitated a number of existing gravity flow systems. Water sources have been enlarged and protected, pipe systems have been extended and additional tap stands have been installed. JENGA has also facilitated community mobilisations and trainings – water committees have been formed that empower the locals to own the upkeep of their water systems. Regardless of how clean the accessible water may seem; it is critical to boil all water for drinking. JENGA is helping ensure the hygiene and water safety of its communities by providing financial assistance for the manufacture of fuel-efficient stoves. These stoves are designed to reduce the amount of necessary (and costly) fuel used in cooking. They are more efficient at retaining heat, allowing time for nearly twice the amount of cooking – ensuring that families can afford to have safe drinking water.